on the island of Isabela, Galapagos. 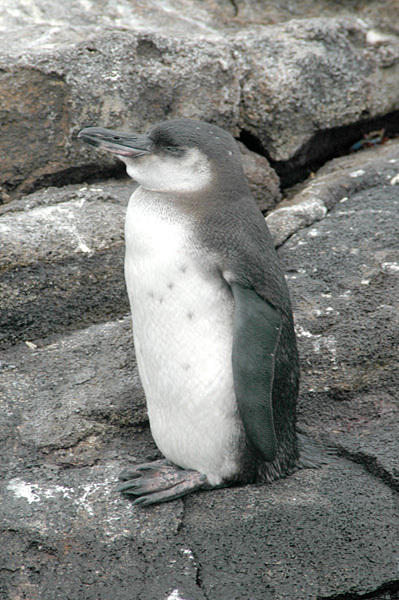 The Galapagos Penguin is the smallest of the warm weather penguins. This penguin stands approximately 16-18 inches (40-45 cm) tall and weighs around 5 pounds (3,5 kg). 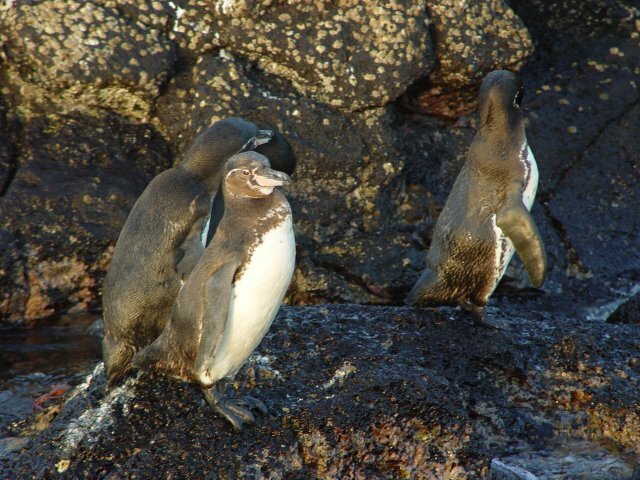 The Galapagos Penguin lives and breeds on the Galapagos Islands and on Isabella Island which are located north of the Equator. after it hatches. When the chicks reach 60-65 days old they leave their nests for good and go to sea. 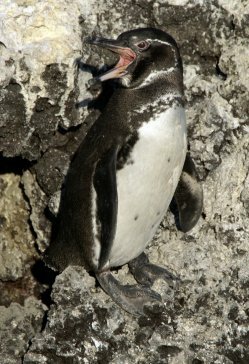 Galápagos Penguin (Spheniscus mendiculus). Three on dark rock by the sea on Galapagos. The breeding period differs from other penguins, as the Galapagos penguin seem to be breeding any time of the year, but is related to temperatures in the sea, which ought to be below 24 degrees Celcius. close-to-the-coastland colonies about 6 o'clock in the morning, and come back from 'job' around 17.00 in the afternoon. Then they stay in the colony overnight. Galapagos Penguin juvenile (Spheniscus mendiculus), Galapagos Islands, Ecuador. because when the 1970 El Nino storm hit over 70% of these penguins died due to food shortage.